' Time for Pumpkin - Sisters, What! It's October 3rd. Know what that means? Pumpkin time ! Ok I will admit I started on the pumpkin stuff back in August. We moved this summer and over the course of unpacking I discovered that I had no less then NINE can of pumpkin puree. I know, I have a problem. So I started baking. There were a few recipes on Pinterest I have been wanting to try so this excess of pumpkin actually worked out for my belly. I mean, so many good things are pumpkin, like pumpkin cheerios, Pumpkin hot chocolate, pumpkin morsel chips, and a pumpkin pie spice cook book! 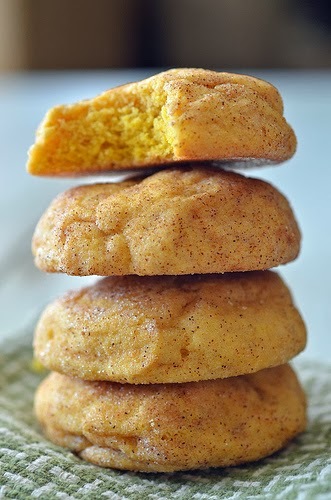 First up, Pumpkin Snickerdoodles. Snickerdoodles are one of my favorite cookie so when I saw this recipe I knew I would be happy. I was. Very yummy and so soft. These made it onto my fall baking list. Find the recipe over at Seeded at the Table. These Pumpkin Waffles and Cinnamon Syrup are a family favorite around here. I might have even posted about them before...they are that good. So delish. 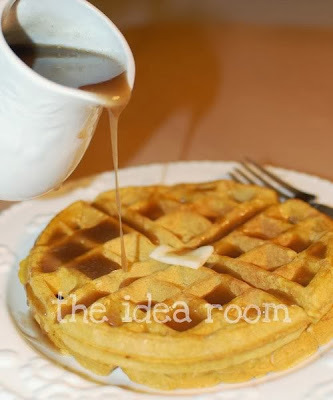 Recipe over at The Idea Room. This last one was amazing. The only thing I would change is the amount of chocolate chips and I added a teaspoon of pumpkin pie spice (that was recommended in the comments). The family loved the bread and thought I was crazy when I said there were too many chocolate chips. Recipe over at Java Cupcake.